Full of affection and boding a calm and friendly demeanor, the Bloodhound is a breed loaded with love to give to others. A tough hound with a sternness to them, but able to be very silly and social, they are an interesting canine loaded with personality. While their reputation is not exactly a clear image of what type of dog they truly are, most imagine them to be a lazy pooch and they are the exact opposite in reality. Wonderful with interacting with little ones, the Bloodhounds are notable family pets. They are not very excited to be trained ever, but they do make excellent companions once you have their training completed as pups. 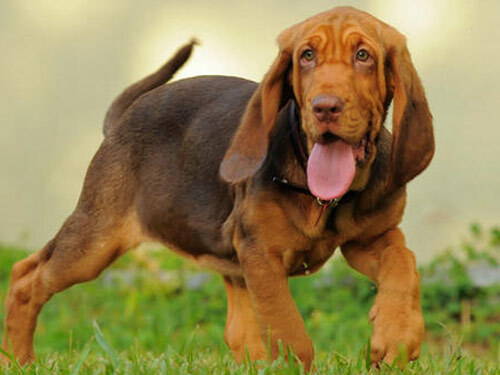 Bloodhounds possess a fair amount of energy and can easily keep up with a daily run or walk. Natural hunters, Bloodhounds are trail walking creatures. They adore an open field and can adjust to any temperature climate. Surprisingly, they are rather affectionate canines despite their stubborn ways. Drooling can be an issue as many opt for a different breed of dog when trying to maintain a very orderly home. Their long and droopy ears will need maintenance, and need cleaned on a regular basis to prevent any infections. They enjoy a cozy bed to sleep on and they do not require much care for their fur coats other than the occasional grooming that is needed for routine hygiene. They are not the most playful breed, even as puppies as their serious side shines through most of the time. Some areas for concern health wise when owning a Bloodhound are ectropion, gastric torsion and skin fold dermatitis. The skin can tend to have health ailments for the many folds and creases the Bloodhounds possess. An overactive thyroid can fall into play as they get older as well, but not for every Bloodhound. Scheduled routine testing recommended by the vet may be covering the dog's hips, elbows, vision and thyroid glands. Average lifespan of the Bloodhound is seven to ten years. Dating back from what experts believe is the St. Hubert’s hound, the Bloodhound breed was founded roaming Europe many centuries ago. In 1066 it was a man named William the Conqueror expanded the breed by exposing it to the English population. Utilized as hunting dogs, the Bloodhounds were a favorite for many religious figures that used them to accompany them on the hunt. They are champion record holders in trailing for long distances and for the age of their trails as well. Quite some time ago, people thought the Bloodhounds were tainted in a way that their reputation for such exceptional trailing made them appear as if they were trailing for humans, by the scent of their blood. They are a growing breed as hunting dogs currently, but still have yet to reach fame as a well respected family pet. Their search and rescue efforts are quite impressive and they are rather sensitive and gentle canines when trained properly.